When I pinned this pic of decorating with Christmas ornaments on Pinterest, I got repinned 97 times! TO me that's a lot. I really liked this idea because I inherited a lot of ornaments that I needed to find a way to display. When you inherit a HUGE box of really old ornaments that once belonged to your Grandma, it's not a good idea to display them on a tree (especially if you have small children.) So I found a way I can enjoy them through the holiday season and know they are well protected from little hands. Since most of my china and glassware is white and clear, the vintage ornaments add bursts of color and is sort of unexpected. We love seeing them in the china hutch. We sort of grouped by color. Pinks and blues are the predominate colors in the mix. I found this Noel glittery sign for around $2 after Christmas last year at Marshalls. I think it looks adorable hanging on the door knobs of the cabinet. These long ornaments fit nicely in our water glasses. 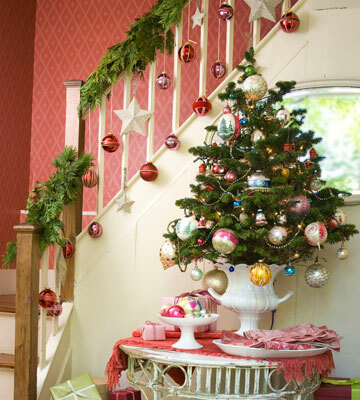 Do you decorate with ornaments in unexpected places? If I ever buy a two story house, I want to try hanging them from the stairs. Are you ready for Christmas?? It's almost here. Can't hardly believe it.